As Bhagat grew spiritually and began to understand the depth of spiritual and mythological realms, he also began to research and create Hindu paintings. 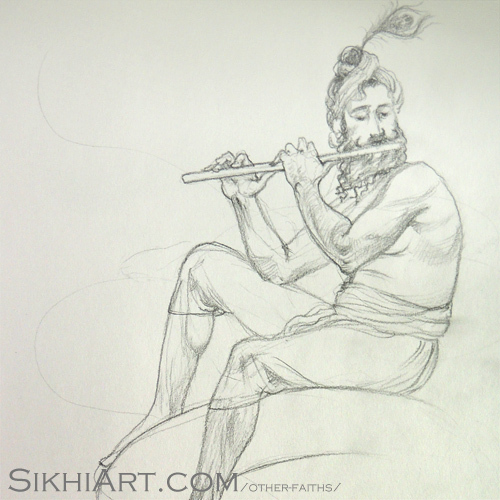 The diverse images of Gods and their stories, inspired Bhagat to paint them! 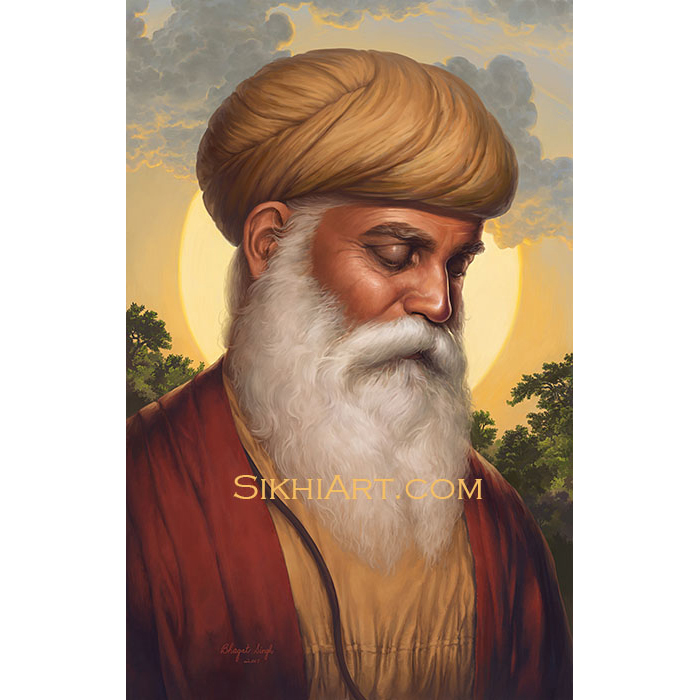 These paintings are inspired not only by texts such as the Puranas, Upanishads and Sutras but also by Bhagat’s Primary Guru, the Guru Granth Sahib. 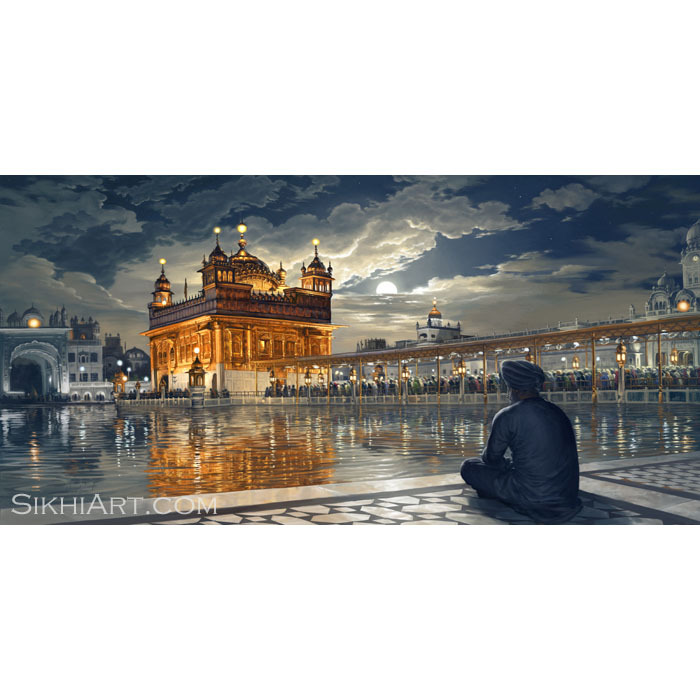 The Guru Granth Sahib contains many beautiful hymns of Vaishnav saints that often fill the artist with indescribable, uncontrollable and overflowing inspiration. Hanuman ji is an exalted Devotee of the Supreme God. He is strong, heroic and assertive, always ready to take action, as well as loving, calm and innocent, and immersed in states of pure love. He inspires us not only to do Meditation, bhakti, but also inspires us to be full of Energy, shakti, to exercise and to stay fit. 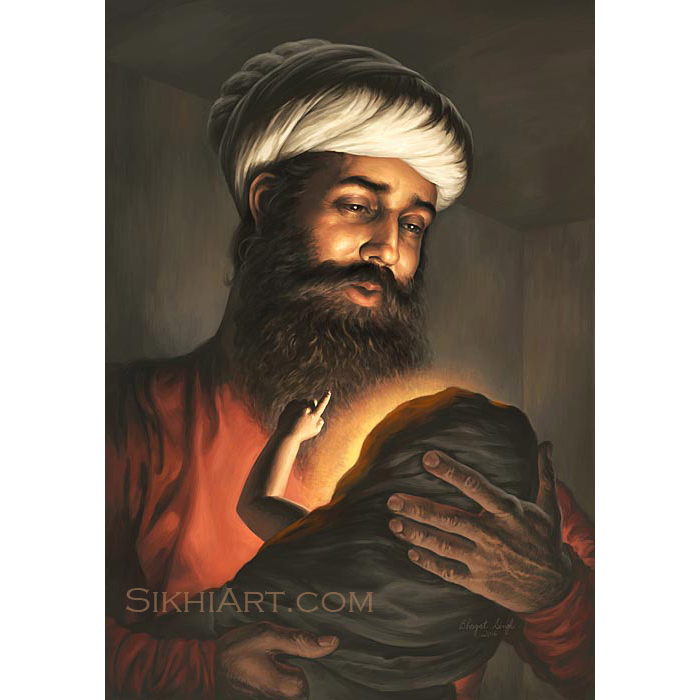 Bhagat Prahlaad ji was still a child when he was brutally tortured to the brink of death. 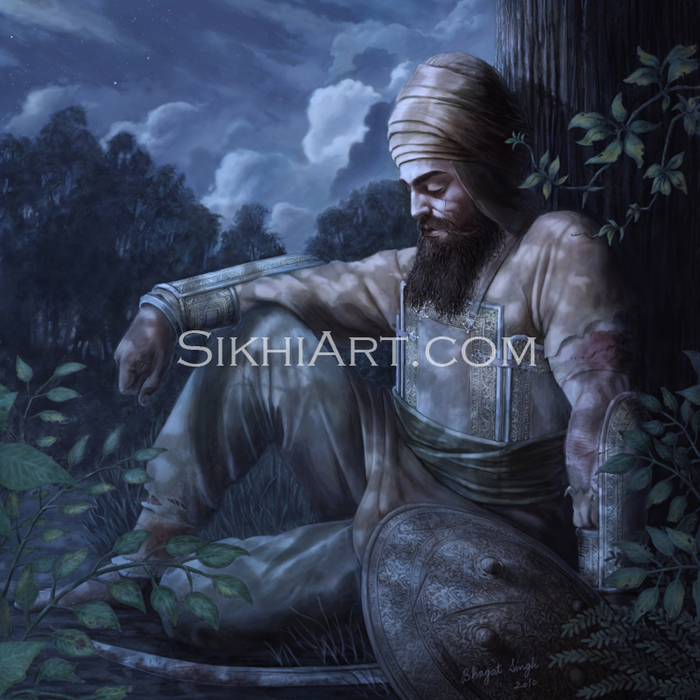 He had refused to give up his knowledge of God and his practice of meditating on him. In the end, Narsingh ji came to protect his devotee. 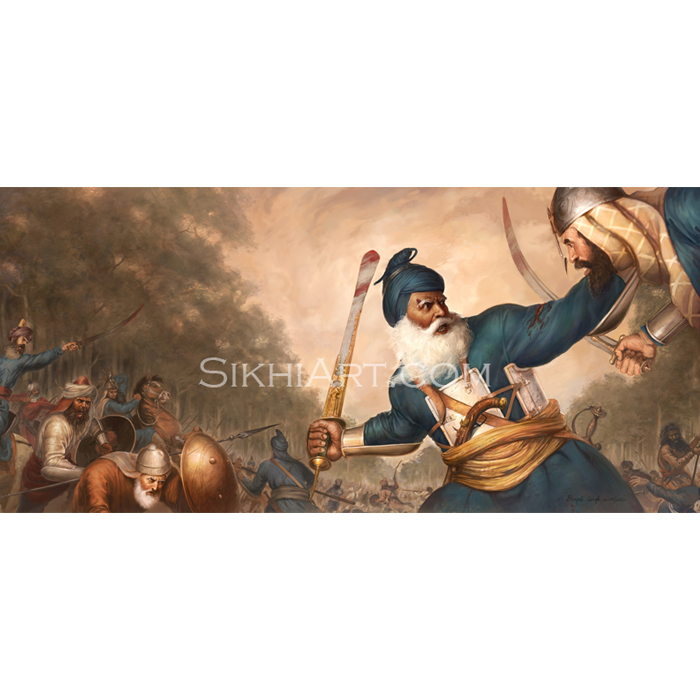 After defeating Hiranyakaship’s army, Narsingh ji battled with Hiranyakaship and then ripped him apart with his claws. In Shaivism, Shiv ji is Mahadev, the Supreme God. He is Sada Shiv, ever-present, pure consciousness, the beginning and end of all things. He is the personification of great peace and great terror in different forms. 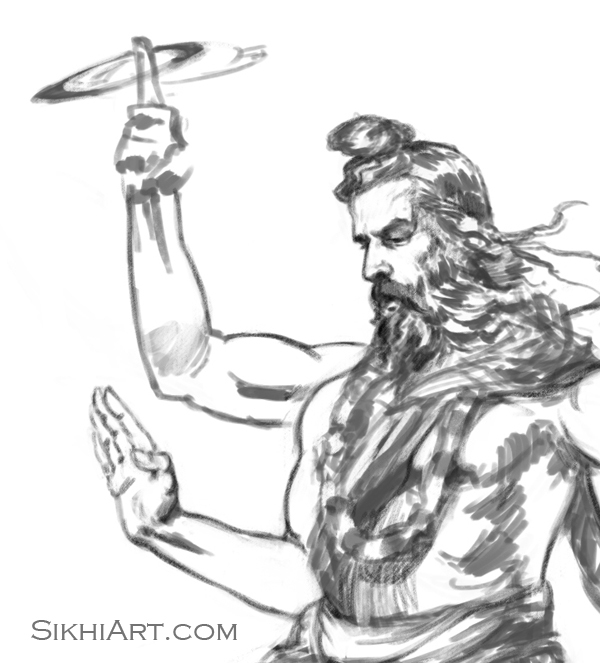 Shiva is painted as the Adi Yogi, and he is bearded just like his bhakts, devotees, the yogis who meditate on him. In Vaishnavism, Vishnu ji is Akal Purakh, one who exists outside of time and space. He is Rama, residing everywhere, he is thousand-eyed without eyes and thousand-bodied without body, and with this leela/play he entrances everyone. Here, Vishnu ji is painted similar to Krishna, as the alpha male, the lover and caretaker of his soulmates. 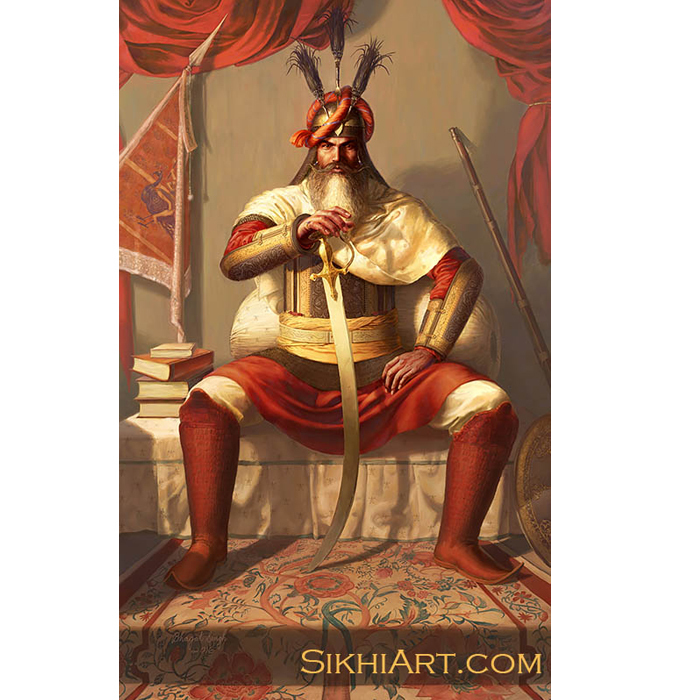 Being abundant, he is royally bearded, seated on his throne, with beautiful crown and jewellery. Even though he has no form or feature, Shri Ram is portrayed as the Chaturbhuj, four-armed Lord. He is seen holding a chakra and a mace. The chakra represents the wisdom and vision (su-darshan) that Ram is everywhere. The mace represents his rule over the universe, that everything happens by his command. 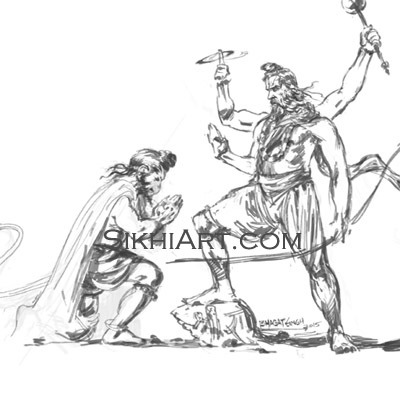 In this sketch, he is blessing Hanuman ji and the stones and boulders, which were used to build a bridge to Lanka, Ravan’s kingdom. In Ganapatya religion, the supreme God is seen as the remover of obstacles, the prime mover. He is portrayed with the head of an elephant since elephants are big, powerful beasts, able to move large objects, and transport them. Ahankar (Ahan – I, Kar- Continous), the constant sense of self that sees itself as separate from everyone else, can neither be destroyed inside nor outside nor upside nor downside nor by man nor by animal nor by projectile nor by weapon nor by day nor by night. Ahankar can only be destroyed by Hari himself. 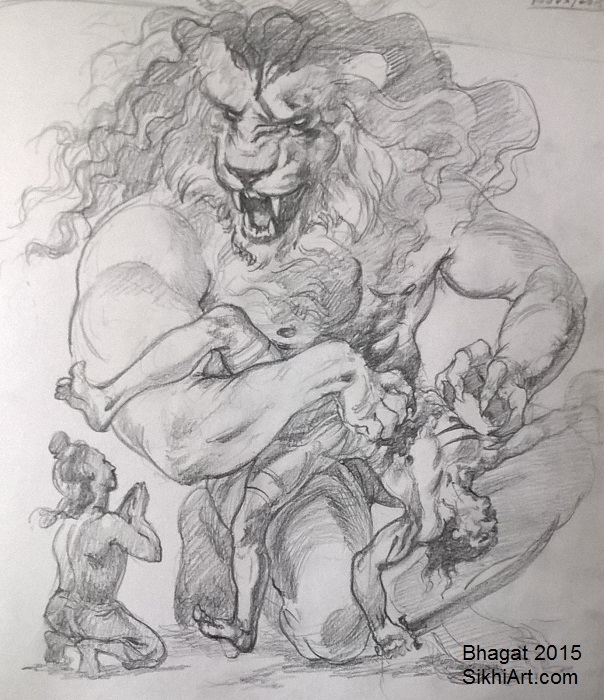 In this sketch, the supreme being, Shri Hari takes the form of a Man-Lion to kill Harnakash, who is the respresentation of Ahankar, and liberates his devotee Prahlaad, who surrenders his self to him. 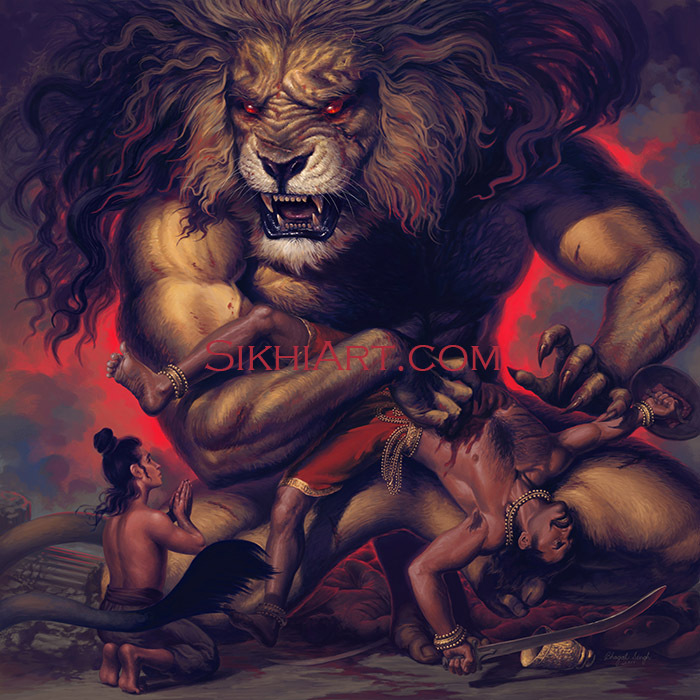 In Vaishnav religions, it is said that the supreme god, Narayan, who vibrates in the heart of all beings, assumed the form of a man-lion to destroy Hiranyakashup in order to save his devotee Prahlaad. You have thousands of eyes and thousands of forms, however you are also without form as you are the source of all forms. You are the great giver, the source of sustenance of all beings. In Shaiv religions, Mahakal is the personification of supreme formless god, as the ultimate death. 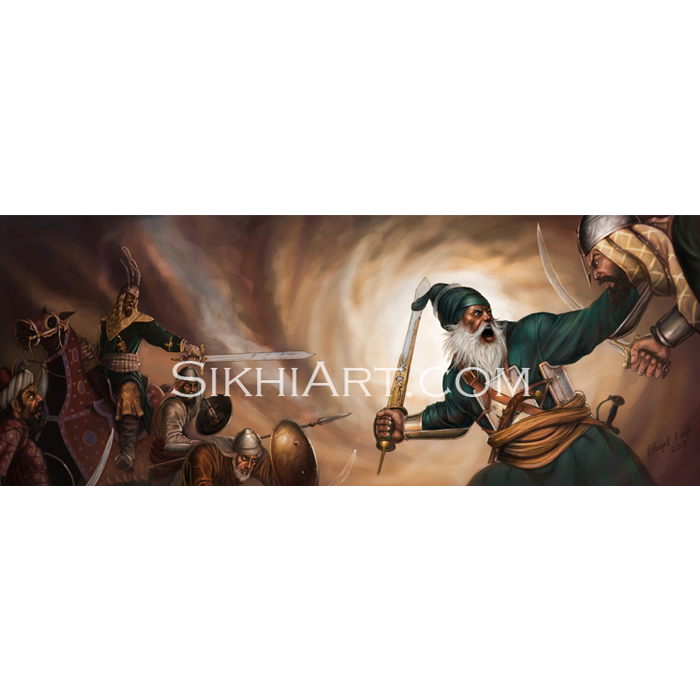 He is also known as Shri Kaal (meaning death) and Shri Kharag (meaning double-edged, straight sword). The dumroo beats – dug dug dug dug – along with loud gongs, in his presence. A necklace of severed bloody heads glorifies his neck. The lustrous crescent moon in his top knot shines bright. His frighteningly large teeth drip with blood and his long red tongue vibrates as he roars a thunderous roar. He is usually portrayed with four arms. However since I am not using any erasers for these sketches, I’ll probably transform that 5th arm into something else. 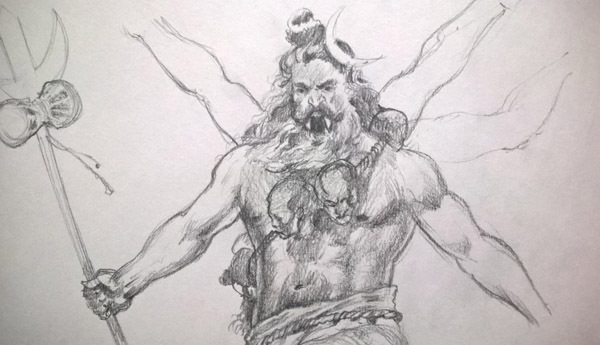 Here’s a quick sketch of Ganpati, which means – Ganesh, the father of all devotees. 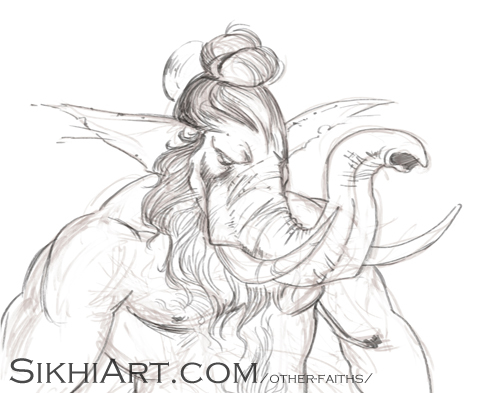 Unlike my previous sketches, I wanted to see what Ganesh ji would look like with a “topknot and beard”. In the Ganapatya religions, the supreme God is seen as the remover of obstacles, the prime mover. 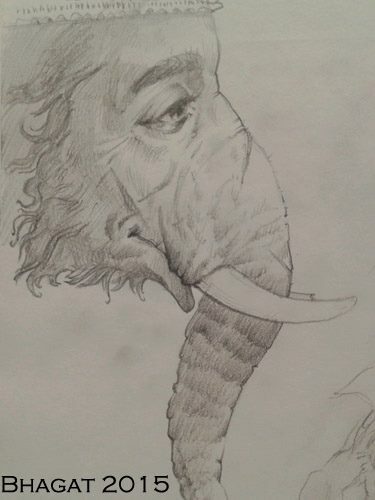 He is portrayed with the head of an elephant with a trunk and tusks. Since elephants are big, powerful beasts, able to move large objects, and transport them, the elephant became a symbol, a representation for the characteristics of the Supreme Being and his qualities. In Vaishnav religions, the One Krishna is the God of Gods, he is the spirit inside of us. Our inner Atma is Shri Krishna and enlightenment comes from recognizing this secret, to see Krishna inside. 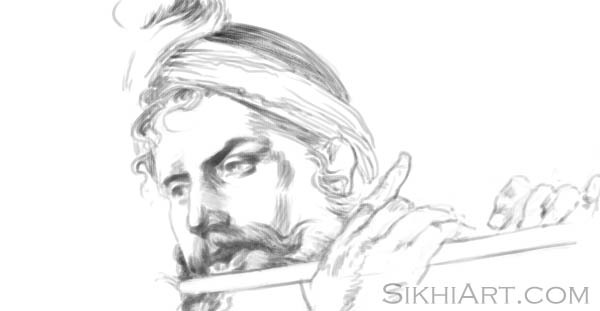 I wanted to improve upon the previous sketch and draw Krishan ji again. A page from my 2012 sketchbook. My father said that it was the most pleasing (pyari) drawing he’d ever seen of Hanuman ji. 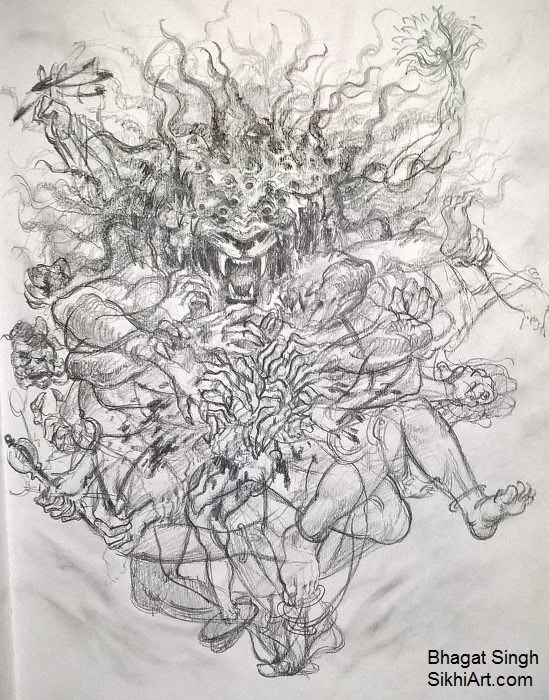 Last year, a couple months after my dad passed away, I started a painting from this sketch. Ram rasayan tumhre pasa; sada raho Raghupati ke dasa. 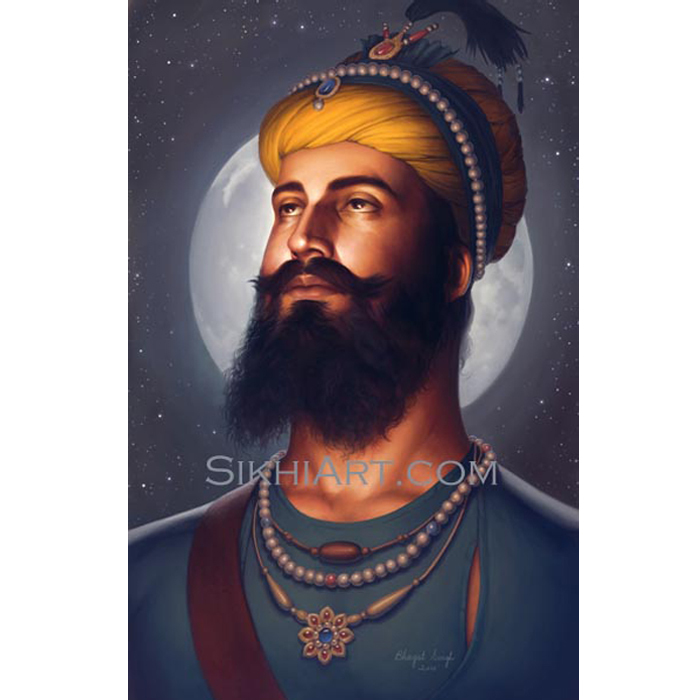 Tumhre bhajan Ram ko pavai; janm janm ke dukh bisravai. Ant kaal Raghupatipur jaie; jahan janm Hari bhakt kahaie. Hanuman Chalisa, by Bhagat Tulsidas ji. Translation by Bhagat Singh. 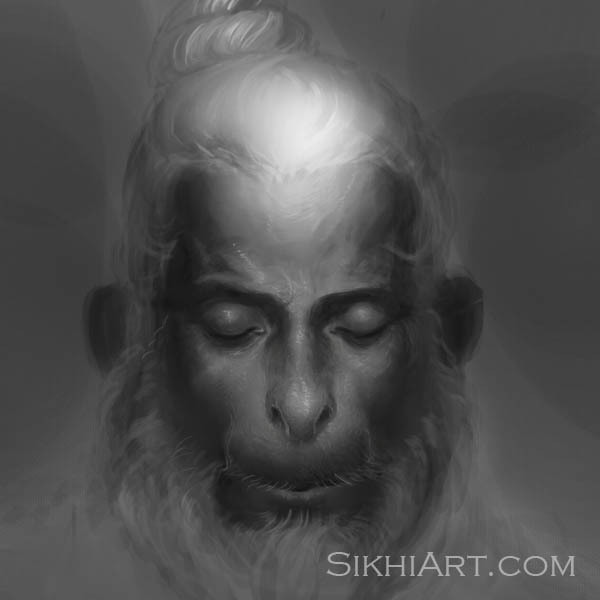 This painting of Hanuman ji, from 2013, was inspired by the species of Indian monkeys named after him, known as ‘Hanuman Langur’. Black skin gets a lot of bad rep in India, even though one of God’s epithets is “dark-skinned one”. 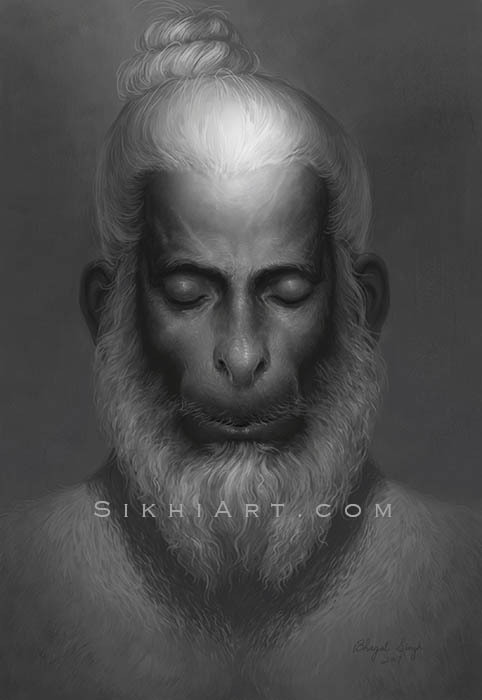 So even though most people associate the image of Hanuman ji with ‘Rhesus Monkeys’, I thought it would be interesting to see Hanuman ji with the facial characteristics of the ‘Hanuman Langur’, with black-skin and white fur. 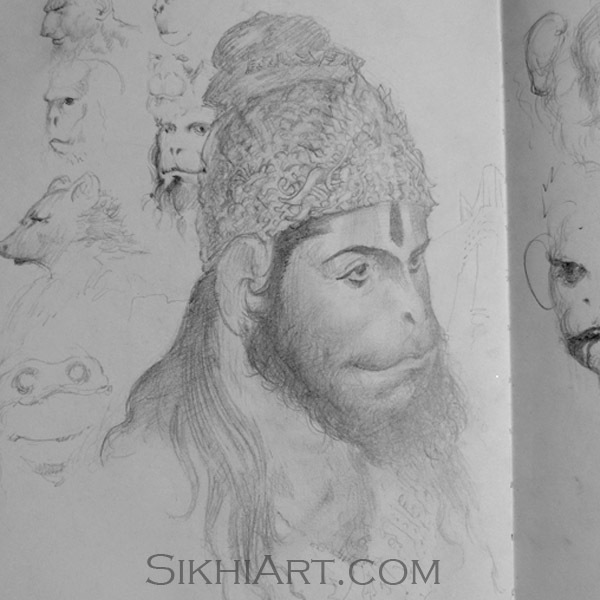 This is a recent sketch I did of Hanuman ji. This earthy version was inspired by early human species which are known as hominids (in Latin). This is why Hanuman ji is holding a wooden club in this sketch. 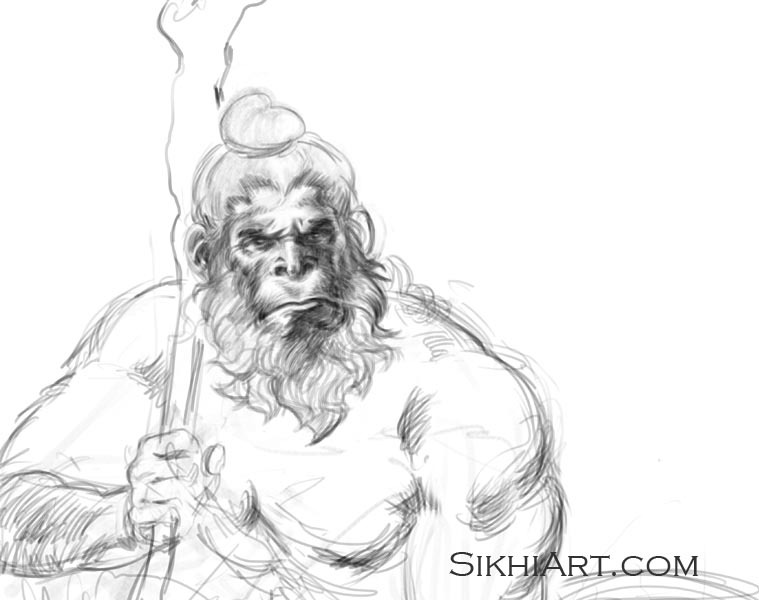 I imagined – what if Ram Chandra ji had encountered early hominids in the forests, who he then made an alliances with? What if hanuman ji was one of the last remaining early humans in India? if so what would he look like? 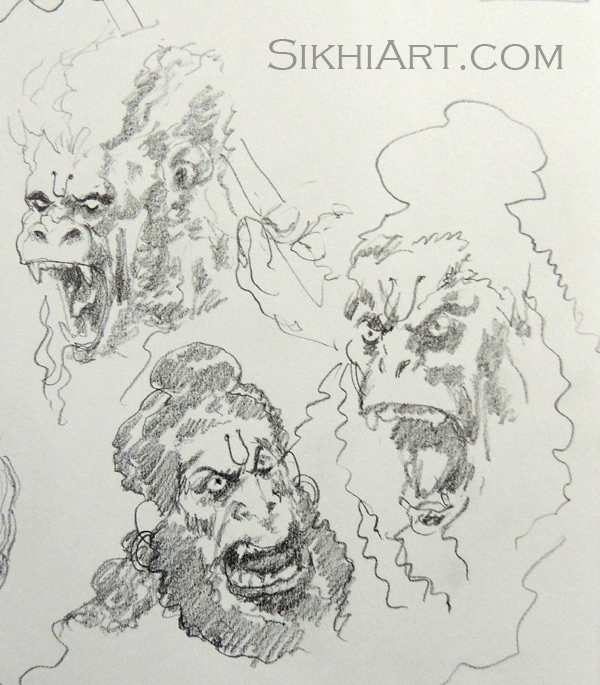 Hanuman was furious! When surrounded by warriors, he planted his feet firmly on the ground, and defeated all of them! That is why he was known as Hanuman! Very nice paintings. 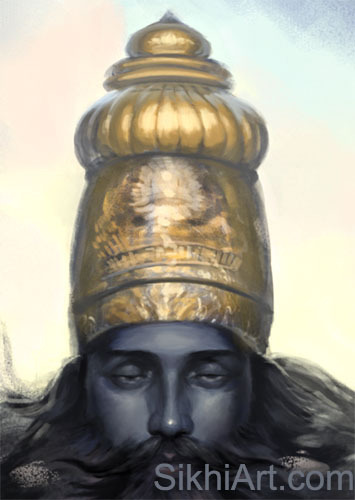 Naturally the Formless God must have looked like this during his avatars. Very natural ji! Thanks Amit! These are representations of the Formless God in various Indian religions. I have never seen such combination of painting and knowledge. 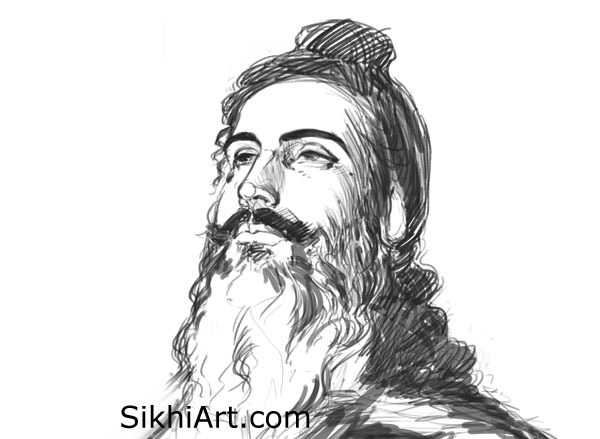 Awesome paintings Bhagat ji. Opens doors to new Bhakti feelings after watching your pictures. You are really very gifted. Do you have any plan on Buddhist art? Nothing in the works. Let me know if you want to commission a Buddhist painting, I am open to it. Hare krishnaa!!!!!!!! 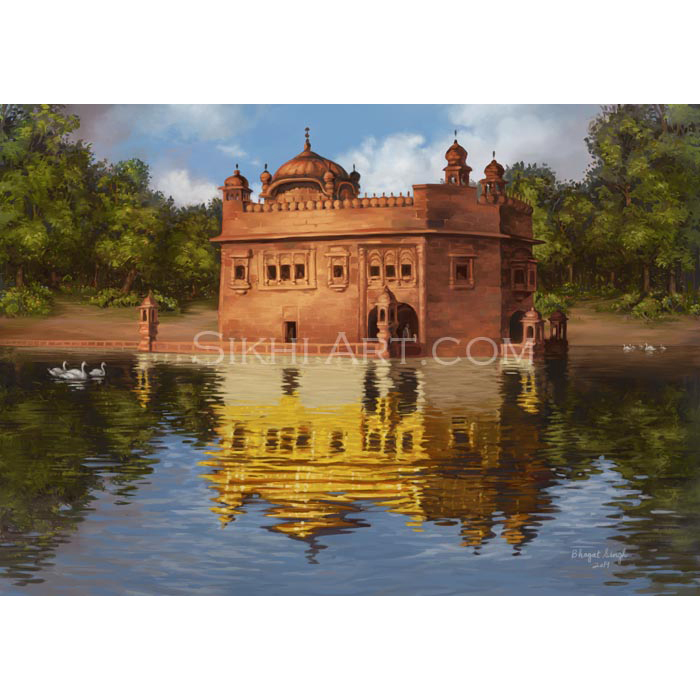 Beautifull paintings…. God bless you..plz make a painting of Radhe Krishna plzzz…..